Whenever Viola Davis makes a grand entrance as a criminal law professor and lawyer on her hit series How To Get Away With Murder, she gives off an aura of complete confidence and fantastic willpower. It's hard to believe that Davis herself has had to overcome a great hardship in the past to get to where she is today in Hollywood. But she has. 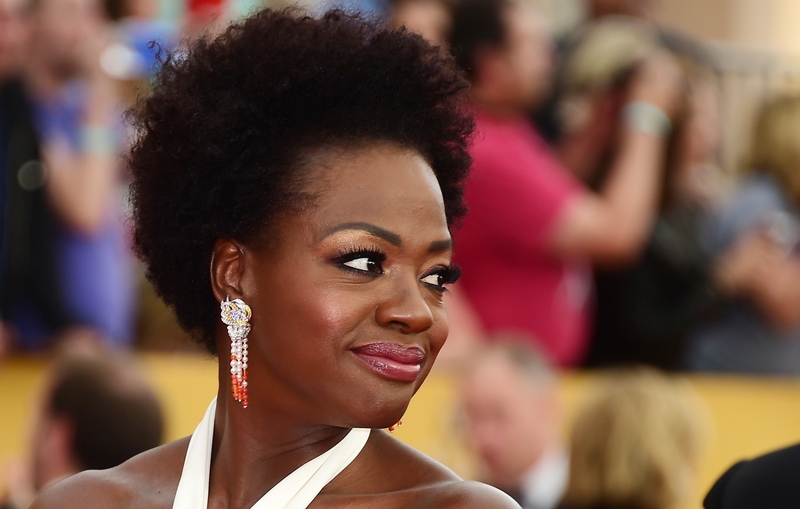 Viola Davis revealed her struggles with child hunger and living in poverty in a new interview with Glamour. While talking about her involvement with the Hunger Is campaign, for which she has raised over $4.5 million, Davis told the magazine that neither of her parents attended high school, and every month the family would receive a welfare check. Though there was food in the home every time the check would arrive, it would be gone before too much time had passed. Davis said growing up in a hungry family in a low-income household affected not only the way she felt on a regular basis, but also her education. "I was always so hungry and ashamed, I couldn’t tap into my potential. I couldn't get at the business of being me," she said. Clearly, she has come a long way since her days of feeling like she couldn't be herself — and not just in regard to finding herself as an actress. From her smart address of the lack of diversity in Hollywood at the SAG awards to her classy, brilliant response to being called "less classically beautiful" than other female leads by the New York Times, Davis has proven herself a force to be reckoned with. And now, talking about the inspiration behind her personal involvement with the Hunger Is campaign further proves her tenacity along with her spirit. Her honest recollection of her less than perfect past shows that it is no longer something that she feels that she has to hide from the world. And that is a positive thing. After all, no one can help what background they come from. No one can help what family they are born into. No one asks from birth to be raised hungry and in poverty. But what people can help is how they use their roots for a greater good, which is what Davis is clearly doing with this campaign. There's no better way to show your passion for a cause than to explain your own personal connection with it. Since Davis was raised in poverty, she will obviously know better than those who came from a well-to-do household what that type of experience is like. Her tenacity and ability to overcome these struggles through her professional success is obvious, but this is also telling of her individual spirit. Though she plays a tough-as-nails character on TV and has been tough on Hollywood to look past stereotypes of what a woman should be, women cannot be expected to be tough all the time. Opening up about her emotions should not be seen as any sign of weakness, but instead a sign that she has developed the potential to get to that important business she missed in school — the business of being her.